Cycling is only to be a fringe matter, hovering at the edge of this post, but given that riding around on my trike is so important to me, it could have been very much impacted by what happened the past few days. I was lucky, fortunate beyond words. I’m going to be cramming this post with past favorite photos whether just for the memory of beautiful scenery, or because it was an incredible moment for some other reason, or some ruin, castle and such I particularly liked. On Tuesday, the 12th of November, I drove Jens to the train station. It had been a gray miserable few weeks, but as we went to the station, the heavy gray cover began to break. I left the station, and the sun came streaming through. The horizons were still tightly walled off with shades of slate and silver which worried me the sun would be gone by the time I got home, dressed, and got the the trike out of storage for a ride. So, to enjoy the precious, faint warmth of a late-in-the-year sun, I drove immediately to the grave mounds at Gamla Uppsala. Wide open space where sunlight would pour down, unhindered by trees. The perfect place to enjoy what has been a rarity of late. Loke was full of energy, bounding around at the end of his tether as I strolled along the path looping around the mounds. It was a bit on the cool side and looked to be turning into a gorgeous day. Large patches of blue appearing between the clouds I grinned at the idea that just maybe it would still a little sunny when I actually did go for a ride after lunch. We finished the walk and I went home for a bit of fruit and a glass of milk for my midday meal. Something light that would be quickly digested to leave me riding relatively unhindered. I sat back on the couch to try writing some while I waited for the food to settle. After about 20 minutes, I became annoyed at having the worst problem typing. Then I realized it wasn’t just typo mistakes. My right hand was acting strange. It got worse until it simply quit responding and had very little sensation in it. Then it was my entire right side. I felt a little dizzy and disoriented. I tried to stand and caught myself on the coffee table with my left arm before actually falling. I limped to the mirror where I forced a smile, being sure I had an symmetrical smile response. That calmed me… a little. Then it was a phone call to my wonderful father-in-law for a ride to the hospital. In hindsight, I probably should have called an ambulance, but I was a bit disoriented. In spite of having very little strength or control on my right side, I collected keys, wallet and phone before sitting on the couch. I’d like to think Loke knew something was wrong and was concerned. It simply might have been that he had heard me talking to ‘grandpa’, recognized that I’d picked up things to leave the apartment and wanted to be sure I didn’t forget him. The idea that 50 lbs of husky was sitting on my lap in an attempt to be another set of keys or a phone had me laughing. In spite of it all, I honestly laughed. I also hugged him. I didn’t care why he was in my lap, it was enough that he still made me laugh through worry and outright fear. Åke arrived in about 5 minutes, calling to let me know he was outside. I stumbled out the door. Actually, I was starting to regain some measure of strength and coordination by that point, but I was determined to get checked. Once in the car, I called Jens to let him know what was happening. He offered to come right back. He was waiting for another train in Stockholm to continue the trip to the southern part of Sweden for business. I told him we could wait until I found out of it was something to worry about. I didn’t want to interrupt his work for what might be just some weird kind of migraine. Oh, and the weather was gorgeous. Clear skies with not a cloud to be seen. Would have been perfect for a longer ride. I told Åke he didn’t have to wait with me. I asked if instead he would mind taking a short walk with Loke around 4 pm if I was still at the hospital. ‘Of course!’ he said. The waiting room looked packed, but the number I pulled was the next one. I didn’t even have a chance to sit in the chair I limped to before it dinged. I went to the window and explained to the woman there what had happened. “Wait right here,” she told me. “I need to talk to someone.” She came back a few minutes later to say, “You sit right here. Someone is going to come out to talk to you. If you feel any change, let us know.” Then she went to another computer to work. I was nervous as I sat there. Finally a nurse came out and asked me to give her a quick briefing as she offered an arm to help me walk through a set of doors to an exam area. The same exam area where ambulances deliver patients rather than the standard emergency room arrivals. I laid down on a bed and she immediately took my blood pressure. That was agonizing. The BP was so high, she had to inflate the cuff so much it felt like my arm was being pinched off my body. Then began the challenge of finding a vein to get blood out of me for a blood test. Every needlephobe’s dream (read nightmare). The doctor arrived. He was a tall, soft spoken man with curly hair of light brown and maybe streaked with a bit of gray. Kristian was his name. Doctors in Sweden are informal kind of people who seem to be more focused on reassuring their patients by being personable rather than remote and rigidly formal, insisting on ‘Dr. Last-Name’. After testing my arms and legs, which were almost functioning normally again, he told me that he thought what might have happened was a sort of hiccup in my circulatory system which might have left me with low blood pressure in my brain triggering my symptoms. They were going to check for other things though, including a CT scan to be absolutely sure. He stayed right there with me as the nurse continued to look for a vein for blood. She’d poked me about 3 times before getting another nurse to help by looking on my other arm. When the third nurse joined them. I started laughing. Nervously, but laughing all the same. Kristian gave me a curious look. “This is funny?” I told him, no. The options were I try to find the humor in it and laugh or I’d break down into tears and screams with a few kicks thrown in. Then I started making jokes about starving vampires. I had all of them chuckling though it was probably as much about the ‘brave face’ I was putting on as my bad jokes. They brought in an anesthesiologist to make a ‘stab’ at finding something and even she failed. Then there was a lull in the search for blood as it was time to go to the CT. The original nurse and Kristian wheeled me through the many hallways themselves. While the actual scan was going on, the nurse (I feel bad I forgot her name) was joined by another, a man of Indian (not American) heritage actually tried again to get blood for tests. I’ll admit it, I broke into tears at that point. It hurt. I’d been stabbed over a dozen times by that time. The man actually managed to get a line in. It wasn’t one they could use for blood, but rather something for putting any medications as would be required. Scan done, the nice woman wheeled me out into the hall to wait for Kristian. When he came out, he took my hand and told me, I’d had a brain hemorrhage. Fortunately, it had been very small, barely a centimeter (1/3 inch) in size. The fact I had remained coherent and recovered muscle strength and function so quickly indicated, while serious, it was not critical. The cause was hypertension. Then he told me I’d have to stay in the hospital at least overnight to get my blood pressure under control. I wasn’t about to argue. I knew how bad it could have been. I was lucky the bleed had been so small and that it had happened in the part of the brain where it had. Kristian stuck with me as I was wheeled to a critical care ward. Only when he was certain I was settled in and introduced to a few of the nurses did he and the first nurse take their leave, assuring me I was under excellent care. I immediately got my hands on a phone to call Jens and ask him to come home. He jumped off the train at the next station to rent a car. The nurses there (4 for a room of 6 people) were all very sweet. When I had a moment where fear overwhelmed me and started crying, two of them came over to assure me I was going to be fine. It was more than reassurance, they needed me to calm down for my blood pressure. What kept me most calm through the night after Jens’ visit was Netflix. I watched it until I was about to passout before trying to get to sleep. Had to keep the brain busy and occupied for as long as I was awake. Good thing the hospital has excellent wireless internet! Was a rough night. I wasn’t allowed out of the bed for anything. I do mean anything. The two different catheters they got in (took an anesthesiologist with an ultrasound machine to get the one for blood) hurt at times as I would fitfully wake to avoid tangling tubes and wires when I rolled over. They also had to check my eyes every couple hours. The bed just KILLED my back. No matter what side I slept on, it just hurt. The machines beeped at me constantly. Can’t remember the last time I was so glad for morning to come. It dawned pretty and clear of course. There was another CT scan to be done sometime that day, so I got to watch a lot more Netflix while I waited. A physical therapist came by and said it was time for me to get out of bed. She talked as if I’d been bedridden for a week or more, not less than 36 hours. I didn’t care. I was just glad to get up into a surprisingly comfortable wheel/arm chair combo. My back was very grateful for it as well. Kristian came by to ask if they’d sent me for the next scan and to see how I was doing. That struck me as incredibly nice after he’d stayed close all through my diagnosis. My case had been passed on to others and yet, he still was following along. That actually helped calm me quite a bit. He came by some time after midday to check again. This time he talked to the head nurse on duty and made a call to find out when my CT scan was. It was going to be done when I was moved from critical care to the stroke ward. So, the wait continued. He apologized for needing to get back to work and told me I was in good hands. It was not long after that, they finally started me rolling to the stroke ward. As I came out of the room, there was Tina. Since M (Tina’s hubby) was a nurse, they let her follow along through the hallways. After a brief pause at the reception for the stroke ward to drop off my things, Tina waited there while I was whisked off for the CT scan. The scan done, I was thrilled to find a large, machineless room with a nice view and only ONE bed when I was wheeled in. There was a desk with a chair and a slightly larger, comfortable sitting chair too. Martina had called Jens for me to tell him I’d gone for the CT. Earlier in the day, I’d decided he should wait for that rather than come to the hospital to see me and end up standing around or trying to chase me down as I was rolled around the hospital at who knew when. Tina was a bit aggravated that no one had told her about me being in the hospital, but put a good humor on it. I promised that next time I’d at least try to remember to text her. She hoped there wouldn’t be a next time, but appreciated it. A short time later, M came in, having gotten off work. Jens arrived not long after that once he’d finished taking Loke for a long walk. After about an hour, M went to see if he could get any news about my CT scan. Turned out the doctor had gone home as it was after 5 pm. The head nurse told him there’d been no change between the two scans which was excellent news we were all glad to have. Admittedly, if the news had been bad, M was pretty sure someone would have said something before going home. He told me to be sure I told the nurses I wanted to see the doctor the next day. M thought that since my episode had been so non-threatening, they might have put me on a low priority. I slept quite a bit better that night. The nurses only came in twice to check me, no machine beeping at me, no tubes or wires to get tangled or inflict pain. The bed was marginally better too. The next day passed quietly. Bad food for breakfast and lunch, both of which I took in the day room that I got to walk down too all by myself. I paced around my room some, very slowly in respect for my blood pressure. Tried to write, but couldn’t get my head into it. So, watched a lot more Netflix. A pair of physical therapists came to see me. Asked questions about how I was feeling and decided that one of them would come back after I’d had breakfast. A bit after I’d eaten, two doctors showed up. Lee, who’s English was a little rough, the other doctor’s name I didn’t catch and no less than 4 interns. I was a bit unnerved by the fact that Lee hadn’t even known there had been another CT scan. She asked if I wanted to go home, to which I responded, ‘Of course! Who wouldn’t want to go home?’ The interns laughed. One of the PTs came back and ran me through a few tests for motor skills, limb strength. We went for a short walk down the hall for me to climb a few stairs. She declared that there was no discernable physical impairment. Always good to hear. She asked how I felt about the idea of going home. In spite of the quick and glib response to the doctor, I admitted to her some nervousness. My last BP check had been on the high end and I worried what might happen to it at home if I tried to get back into normal activities. She made note of it. Kristian came by again, glad to see I’d been moved and that I felt as if nothing had happened. He knew about the 2nd CT and told me there had been no change since the first one. I made no mention that I already knew that. Far be it from me to spoil the good news of such a nice person. Later around sundown (3:30 pm at this time of year), an occupational therapist came by. Her job is to help people who might have impaired function adjust to the new reality and find ways to overcome difficulties to do what needs to be done. Since I don’t have a job really, she was just there to check my cognitive abilities mostly and my emotional state. The doctor’s question about my wanting to go home had me wondering if she was just checking my mood or if it was a real possibility. While I pondered that, M came to visit before his shift. You know, he’s an incredible guy. Not only is Tina fortunate to have found him, but so are the rest of us for having him join the family. The more I come to know him, the more he impresses me as a person. After our chat about personal things in our lives, he spoke candidly about how lucky I’ve been with this incident. The things he’s seen in ICU with such hemorrhages. Not just the obvious death or reduced to a vegetative state, but even the seemingly minor ones turning someone into a completely different person. Sometimes violent or other drastic personality shifts. He thought I should maybe even have another night in the ward to be on the safe side. Then he had to hurry off to the ICU. About 10 minutes before 5 pm, a doctor came by. It was the one who had stood silent while Dr. Lee talked. There was something about her that seemed familiar, but nothing clicked for sure. She asked when my husband was coming. I was going home and she thought he should be involved. She told me she’d be down the hall if I wouldn’t mind letting her know when he arrived. Jens came, bringing stuff I’d asked for in case I had to spend another night. I fetched the doctor. She was very nice and social. I guess she wasn’t in a huge hurry to get home and the ward was other wise quiet. The more we talked with her, the more I had the feeling I’d met her before. Then she mentioned that she’d lived in the states for a while and also had been an exchange student in Montana. Jens and I looked at each other. “I remember that,” I told her. “I thought you looked familiar, but I remember you telling me that most of all. I can’t remember when I’ve seen you before though!” I absolute cannot place when I might have seen her in the hospital before. Rather than being offended, she laughed about it instead. Soon, Gladis (nurse) came to remove the catheter in my arm for liquid medications and I was on my out the door, prescription in hand for no less than 3 kinds of BP medication. I smiled and thanked all the nurses for being so great. Felt a little bad I had no chance to say good bye to Kristian and thank him again. Since then, it’s been a little rough. Yesterday (November 16th) the worst. I feel sluggish and drowsy. When I try to do anything, the muscles of my upper torso start to ache something fierce and I feel weak. It’s as if I’ve just come out of year of being bedridden, not a measly few days. It freaks me out more than a little. This morning, I’m starting to fret about how this is affecting Loke as well. I’ve not been for a ride in over a week. In the wee hours before I got up, Loke was unsettled. He kept getting up and fidgeting, groaning a lot as he did as if he’s going stiff and arthritic. Earlier in the year, Loke would limp and hop a lot on our infrequent outings. Mostly infrequent because I was worried about the arthritis that caused it, trying to coddle him. Then I decided to stop worrying about that. I ceased trying to give Loke a longer, tedious, frustrating life and decided to give him one of fun and quality even if it turned out a year or so shorter. In doing so, I might have actually stumbled on giving him a longer and happier, fun-filled one with lots of cycling. All I know is that sometime in September, I realized I’d not seen Loke limp in weeks. 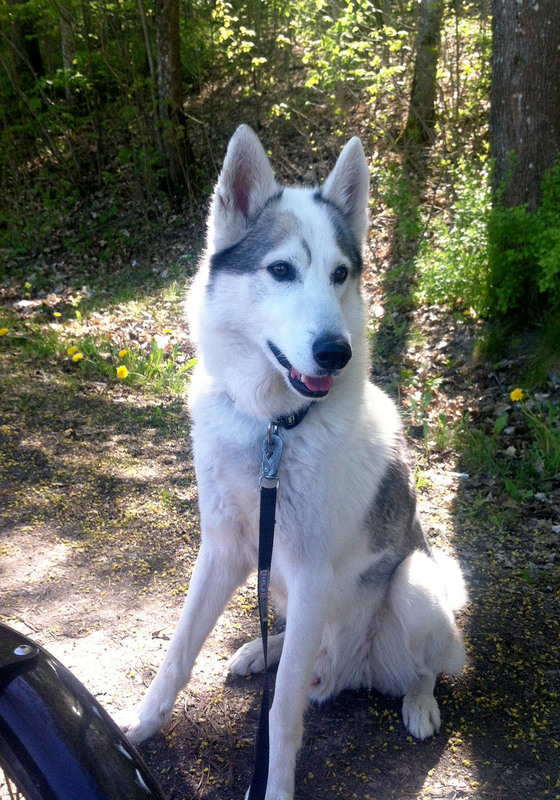 By the time of our trip to Bornholm last month, it had been months and he was a furry powerhouse of happiness. I don’t want to lose that for him. Those wheels need to be under me for both our sakes. Not to mention Jens’. The man has been wonderful, stepping up to the plate to ease things for me as much as he can while still working at a demanding job. Not the least little complaint. I want to take some of that weight off him, even if it’s just taking a roll on the trike every couple days to spare him the occasional longer walk with the furry. Poor Jens has had a couple of scares since I got out of the hospital. Out running errands, calling to see if I needed anything. When I couldn’t find my phone right away, he’s started rushing home in case my lack of answer was because something had happened. I guess I need to keep the phone closer to hand to spare him that. It’s a comfort to still have someone on my side and working to get me through this. If not for Kristian, especially since he called the house on Sunday, I’d be feeling a bit like I’d been given a bandaid for a broken leg and cast adrift. He also was to have an MRT(I in English?) scheduled for me. A notice of the time will arrive by mail. He couldn’t talk long as his beeper went off for another ER case. I had to smile at the image of a red cape appearing on his shoulders as super doctor sprang into action for the well-being of another person. A bit of a contradiction perhaps, as he’s really such a calm and soft-spoken person that brings a sense of comfort to his patients at a time when they’re fearful. So, that’s been the past week for me. I know it to have been a very close call. So many things could have gone so much worse. I could have ended up with a drastic, negative personality change. Perhaps paralyzed on the right side or even left in a vegetative state.